In the Apple ebooks case, the federal government wants to change the way that Apple does business — not just for ebooks, but in all content markets. The new proposed punishment (embedded below) might not seem all that different from the original proposed punishment, in which the DOJ wanted Apple to drop in-app purchasing restrictions for competitors like Amazon (s AMZN) and aimed to restrict publishers from using agency pricing for five years instead of two. But it devotes more attention to Apple’s policies for in-app purchases and to the way that Apple sells content in general. In its revised remedy, the DOJ delves deeply into its criticism of Apple’s in-app purchasing policy, which it now claims Apple changed in 2011 “to retaliate against Amazon for competitive conduct that Apple disapproved of.” As background, in 2011, Apple changed in-app purchase rules to require that any content sold through apps must also be sold through the iTunes Store, and forbid publishers and retailers from sending users to websites outside their apps to make purchases. As a result, Amazon removed the Kindle Store from its app and retailers like Barnes & Noble (s BKS) and Kobo followed suit. At the hearing earlier this month, the DOJ argues, “Apple misrepresented the factual circumstances surrounding this matter, including how the App Store operated and operates…It simply is not true that Apple receives a 30 percent commission from all retailers for all goods sold through apps.” It uses the examples of shoes at Zappos and physical books at Amazon — seemingly arguing that Apple should treat physical and digital goods in the same way. The DOJ includes Apple’s in-app purchase regulations as an exhibit, and also includes a Steve Jobs email from 2010. Publishers are still likely to hate this proposal, as it would still significantly extend the amount of time that they are required to allow Apple — and thus other retailers — to discount their books. HarperCollins, for instance, was the first publisher to allow discounting of its ebooks: It’s done so for nearly a year now, meaning that it has just one more year to go before it can renegotiate retailer contracts. But the DOJ’s new proposed remedy would likely tack at least another year onto that waiting period. Penguin and Macmillan, which were the last publishers to reach settlements with the DOJ, are punished with particularly long waiting periods: Macmillan would have to wait four years to renegotiate contracts under this proposal. Apple didn’t require that content sold through apps must ALSO be sold through the iTunes store; it forbid publishers from selling subscriptions in an app through any other means period, regardless of whether the content was also available in the iTunes store. In other words, the article makes it sound like Amazon could have continued selling Kindle purchases from within their app but also offered readers the choice to pay with iTunes. That’s not true. In fact, Apple forbid publishers from using any other kind of in-app subscription mechanism other than the iTunes account purchase, period. So the choice for Amazon was: Offer ONLY iTunes in-app purchasing with an Apple account, or offer no Kindle in-app purchasing at all. They chose the latter. This had big side implications for newspapers and magazines as they began to try to sell digital subscriptions in their apps and found that Apple wanted to own the customer and take a 30% cut. I’m a bit confused here. A friend of mine (a bibliophile) has at least 1000 rare books on his hard drive. I have read, sampled, and borrowed several … they are pristine, especially in the image format of *pdf. So, please pardon my nullity,but if he chooses to acquire these books at will, then why the law suit? Who benefits from from these exercises in legal futility? Who? And therein may lie the answer. Apple has a right to set any rules it wants to for anything it sells in its store, just as Wal-Mart or Amazon can set such rules. This is America. Land of free markets and the freedom to make money, hire people, create wealth (including more taxable income) and realize big dreams of making lif better for billions of people. The government has no right to tell Apple, or any other company, that it is required to follow policies that would cause it to lose money in order to sell a new product. I actually switched from a Windows Mobile phone to an Android, never considered an iPhone, since, first off, the iPhone’s screen is too tiny. iTunes as a distribution system is amazing. It sells anywhere that international banking takes place. It’s a global digital distribution system. Every hour of every day the sun comes up somewhere and people are buying from the iTunes system. The suggestion that this is not worthy of a 30% carrier charge is ridiculous. It’s an amazing bargain and it’s part of Steve Jobs initial effort to allow content makers a chance to make money on their products. It is part of the Apple crossroads between technology and the liberal arts. Apple is a standout for paying authors for the work. They have aggregated content in a way that supports the copyright owners. InApp purchase is simply another transaction on this global system – logic dictates that inApp purchase would never be a free service. Well said. I see why you write for a living! I have read dozens of books from Barnes & Noble and the iBook Store on my iPad. I can also read Kindle and Google books on it (first generation iPad, too). So , I am not clear about the hub bub regarding this issue. Nor do I understand Amazon trying to control the market by selling books under cost. In other news, the DoJ has ordered McDonalds to put Burger King Whoppers on their store menus, and allow Burger King to staff McDonalds locations for the purpose of selling Burger King menu items. Burger King has not been ordered to give McDonald’s equal access at its locations. How silly that you rail against their actions while enjoying gas prices below $12 per gallon. Make sure and ‘tip’ the gas stations the difference when you leave since you feel so strongly about their non-intrusion…Speak with your wallet not with your mouth. I for one am glad they counter certain abusive market forces (such as this) on the side of consumers. And believe me – I am no fan of government. But this is not one of those things to rail against unless you are a blind sheep. The DOJ and the NSA have created a new law (well its not really a law, just them doing what ever they want when ever they want). Its to be called “The Thought Police rules”. No matter what you say, think or do, they know better. Any thought you have can be held against you like its the actual crime X 10. Want to punch some one out…… you can be charged with thought murder. You are going to the chair.. so get used to it. The IRS loves this as all of us are guilty of defrauding the IRS, so we all are being charged 175% of our taxes for such criminal behavior. Shame on all you offenders…. Thoughts are BAD. You should refrain from thinking…… just like the DOJ and the IRS and most of government. Ps, its ok to take the money from the cash register and go home, just do not think about it…. Got that. ??? Our government…… Dumb or Dumber..??? Government has no right to tell a store what to charge. Period. End story. If the store charges too much, customers go to a cheaper store. If that’s your story, it’s barely an essay in length. Of course the government can tell them what they can and cannot do – because we asked them to during periods of crisis when they did *not* tell them what to do. Think of the capital system as a currency. It’s regulated to give people confidence in it. When people abuse it (call it counterfeiting), people lose confidence. So it’s the people who want these regulations of anti-monopolistic behavior. Make no mistake. Apple is a bigger abuser of monopoly position than MS ever was at it’s high point. All Apple did was to create a reason for Amazon to create the Kindle Fire and sell that at about cost. I am not sure if Amazon would have spent their resources on the Kindle Fire if they could have the own iPad app that worked with their payment system. I guess if Amazon is pure goodness, I can buy and iPad from them (and not another vendor on their site). BTW, the 30% charge for in app purchases is really excessive and results in significant inconvenience for loyal Apple customers. I’d love to see that 30% charge for in-app purchasing come to and end. I’ve loathed it from when Apple first announced it. The move wasn’t just greedy, it was stupidly greedy. Perhaps no better illustration of DOJ’s heavy tilt toward Amazon could be found than that remark. 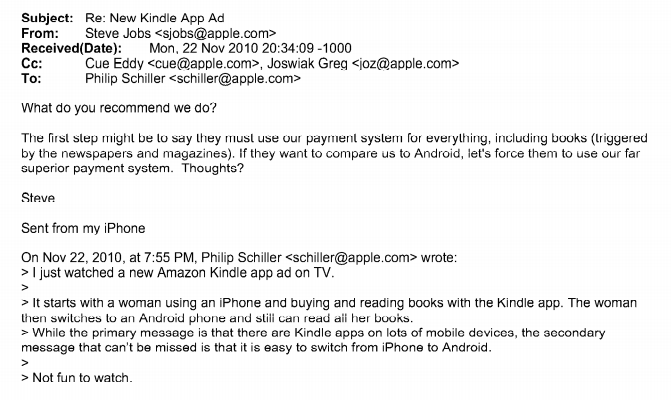 Does the DOJ really believe that the ebook market was competitive when Apple first entered it? At that time Amazon controlled 90% of the market and was selling popular titles below cost to destroy its competitors. Amazon’s market share is now roughly 70%, so it seems obvious that Apple is making the market more rather than less competitive. And according to a study done by Smashwords founder Mark Croker, prices of ebooks have been going down rather than up. That’s a good indication of a healthy market. Any publisher who prices ebooks high will find customers moving to their competitors. Perhaps the only thing fouler than DOJ’s lawsuit against Apple was their attack on the Big Six publishers. A good case can be made that no market in human history is in less need of government intervention than digital books. It’s not just that virtually anyone with a PC or Mac can enter the market–typically referred to as the barriers to entry. That would be impressive enough. It’s that, given the huge server farms provided to any and all by online retailers, any such author or publisher can go toe-to-toe with the giants in sales volume. My latest book, My Nights with Leukemia, appeared on Amazon’s Kindle store yesterday. Since it is for those who are caring for a child with cancer, it’s unlikely to become a NY Times bestseller. But there’s no barrier in place to keep it from doing so. Amazon’s servers might have strained (slightly) if it’d sold a million copies today, but that’s all. That wasn’t true when books meant printed books. In that era it was virtually impossible for any small publisher print and distribute print books on that scale. Large press runs (and thus large profits) were the exclusive preserve of large publishers. My opinion changes from day to day. Some days I think the DOJ’s lawyers are simply extraordinarily stupid. Other days, I suspect they’re in Amazon’s pocket, doing its bidding like obedient little puppies. You can find evidence for either. What you can’t find is sound legal reasoning. The ebook market needs this intervention by the DOJ like a fish needs a bicycle. It’s worse than useless. When B&N entered the ebook market they reached a 20% of the market share in the first year just before the iBook store was launched, taking into account that 20% and the other stores where is the data to say that Amazon had the 90% of the market? 1. Amazon having 90% of the ebook market is a well known fact, the temporal concerns of when they had 90% is a different matter, however when you own over 50% of a market and a selling best sellers at a loss in order to drive out competition and create a standard consumer perspective that ebooks *should* be sold for $9.99 (a fixed price), then you are certainly not creating a healthy market. 2. The temporal average price went up for best sellers, as it should, if they were being sold at a loss, any attempt to sell them for MSRP would be a price increase. A better statistical angle would be to account for books that were being sold at the original MSRP of the publishers during that period against books that were being sold for higher than the original MSRP during that time. This would give a better indication of what the book market actually was like in spite of loss leading tactics by competitors. If anything this is price fixing by corollary only, publishers have been selling books at the same prices for eons and much like music there are standard prices that are used across the board for bestsellers, hardcover, classics and so on. Moreover these prices change dynamically over time and with rarity no longer being a cost factor in ebooks, the trend is almost exclusively downwards. As for in-app purchasing, I can think of several reasons why Apple would move away from it just off the top of my head and none of them have to do with Amazon. Any data to support this “known fact”? Then the fact is that prices went up. And the fact is that the average price of accused publisher went up. The fact is that published forced that the prices for ALL the stores were the same forcing the Agency Model. Agree with you. The only company using its monopoly position to control the market for e-books was Amazon. DOJ went after the wrong company, and the judge in this case totally lacks an understanding of how free markets can work to the benefit of companies and consumers. And how distortions in the market, such as those created by Amazon’s cutthroat pricing, cannot continue forever. Oh, my heart just bleeds for Apple! Wah! The DOJ wencompany. How did Amazon get where it was? It was not forcing users to go after their product or service by limiting their choices. It was by providing the lowest prices that consumers have this incredible habit of going for. Screw that. I stopped buying from iTunes over five years ago in favour of Amazon. If something went wrong with the download, I could always try again. In short, it’s about CUSTOMER SERVICE. Get it?! Amazon pays authors better royalties, gives better access to more devices and lets customers do the choosing. It is a shame that Apple and it’s never ending supply of sockpuppets who think the company can do no wrong. The evidence tells a different story. Maybe Apple fans should stop trying to change the narrative. Yes, the prices went up, to slightly above cost. Now, they’ve come back down. And nobody is making much of a profit. I think books, authors and publishers who create them, are worthy of making a profit. Amazon apparently though it was more important that they control the market than that the industry make a profit. Apple never intended to control the market. It just didn’t want to participate at a loss. What would stop a customer from using a different picece of hardware to read books? if they don’t like the Apple Ecosystem, use Android, use Kindle … it’s not like there aren’t options. per TK’s point below, it’s not like you can buy books from other vendors on a kindle. With regards to the 30% in app costs, I think this is totally reasonable. Apple is providing a platform for you to sell your wares. You don’t have to use it … if I am a baker and sell donuts to a coffee shop, are they allowed to mark them up? Apple is providing the store and infrastructure for your sales … rather than have apple individually price your products for you, they take an across the board standard profit margin. Whether it is a good idea from a competitive perspective with the likes of Google Play store and others is a good question, but whether it is fair seems silly. You know that IAP items are not stored, promoted or distributed by Apple, don’t you? Ahem you wouldnt want your shop to sell others’ goods without them paying you. I can clearly see where you are coming from. Really, they are not selling other good in their shop. Yes, from somewhere where people try to know what is talking about, now what you’re doing. OK, lets drop the 30% rule. You pay 8% credit card charge for processing, You pay 10% for iTunes store overhead, saleries, etc. You pay 25% for the giant server centers to send the book, get your order, etc. And you pay a fuel surcharge of 7% for the power companies that supply the power. That is a total of 50% charge just so you can not complain about the 30% flat fee. Just think about it. And yes, the DOJ lawyers are more than just stupid, they are extraordinarily stupid. Perhaps they should try the IRS for un-american activities etc. Most retailers mark up prices of goods 50% or more from wholesale levels. Thirty percent may sound high when you hear it out of context, but it’s not high relative to retailing in general. What comes to mind in reading that email from Jobs and the reply is that Apple is more concerned in relying on control of its customers than their customer ability to decipher quality and so on. If you want your customers to remain loyal, the way to accomplish that is to make better products and offer better services at the best possible prices, not by limiting their choices and trying to hide what competitors have to offer. If Apple’s products and services are so superior, wouldn’t it’s customers or potential buyers find out for themselves without being locked into a dark room where the only light is the one shining in their face from Mount Apple? It’d be nice to think so, but if that were the case, our manufacturing base in the US wouldn’t have jumped ship to Mexico, China, etc. In many cases Apple already has the superior product in terms of ease of use and functionality EXCEPT for these rules they’ve imposed themselves. Like in-app purchases of digital goods on Amazon- you can’t buy it directly through the app, you have to go through the website. It’s a stupid rule that backfires by making Android look better in comparison. Apple doesn’t want to have to compete with Amazon because Amazon clearly has a far superior infrastructure in terms of digital content. I personally am never going to buy content like movies from Apple BECAUSE of their DRM and lack of cross-platofrm compatibility. Apple OUGHT to either be forging alliances with Amazon to offer streaming content deals and agree on a price structure that sends streaming customers to Amazon and digital downloads customers to Apple or, alternatively, forging partnerships with Sony and Microsoft and Roku and Nintendo and Google to offer iCloud and streaming on their services and compete directly with netlfix and amazon, forcing lower prices for customers. Instead, the spoiled child who never learned to share is going to take his ball and go home. Schiller saw an ulterior motive for the convenience of connected reading? Seriously? His email reads like that of a petulant child! What’s next? Preventing people from being able to read tweets both on an iPad and a Nexus 7? When does such idiocy and greed end? Hopefully as soon as you stop posting the idiocy. Stop calling the kettle black. Apple fanboiz can always be counted on to be blind fanboiz. Still calling the kettle black. Didn’t someone said it takes a bigger one to see an one, blind I mean. Fanboiz always attack the critics, never the criticisms. If the consuming public finds a system causing more trouble to use, costing more than they think it worth, they’ll decide what the market will keep. Whiners will keep on whining even in the face of marketing success. That’s your problem – not Apple’s. The sad part is a certain number of bureaucrats will share your religious zeal. Nope. The problem with fanboiz is a thorough ignorance of the law and a blind worshipful attitude towards a multi-billion dollar corporation.